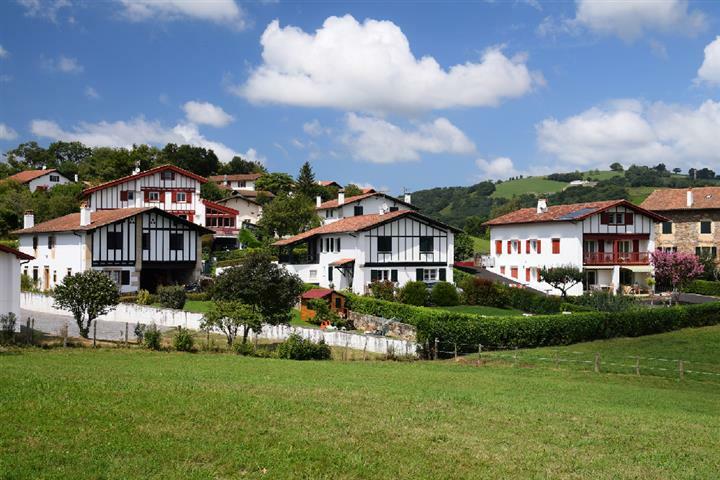 10 minutes from Biarritz, beautiful traditional basque house with a beautiful view of the mountains. Main 400 sq.m house and a 70 sq.m outbuilding. Beautiful 6000 sq.m landscaped garden. Close to Sauveterre de Béarn, by the river, 520 sqm lovely proprety featuring vast reception rooms and 8 bedrooms, fireplaces, parquet floors, high ceilings. Splendid 2 acres park with heated pool. A few minutes from shops and 50 minutes to Biarritz. Urrugne, bright 350 sq.m house built in the 1990's with quality materials on a 2 500 sq.m garden. Facing south, the 350 sq.m house offers a magnificient view of the mountains. It has a large swimming pool surrounded by terraces and garden. 250 sqm house on 2000 sqm land with pool. Beautiful view of the ocean. 4 bedrooms. In a peaceful area. 5 minutes walk to the beach. Anglet, 100 meters from the beach and Chiberta golfcourse, rare 1.495 sqm land allowing the construction of a 375 sqm house, in a natural and wooded environment. Bidart, beautiful 140 sqm renovated house ideally located on the beach. Studio with a superb view of the sea and the mountains. 1170 sqm garden, resting pavillon, private access to the beach. This authentic 18 th century manor house of approximately 270 s.qm consists of 3 living rooms, 5 bedrooms. Parquet floors, fireplace. Beautiful terraces. Outbuilding of 35 s.qm and garden of 890 s.qm. Within walking distance to shops. Parking spaces. Arbonne, close to Biarritz and Bidart, beautiful 330 sq.m house built in the 80's and renovated in a contemporary style. Large living-room, 7 bedrooms and 3 bathrooms.2.500 sqm garden with a heated swimming pool. Garage. Less than 5 minutes from Saint Jean de Luz town center, rare 160 sq.m house built in 1650 entirely renovated offering a view of the harbour. Vast living and dining rooms with equipped kitchen opening onto terrace and garden, 3 bedrooms. Fireplace, parquet floor, high ceilings. Rare property.